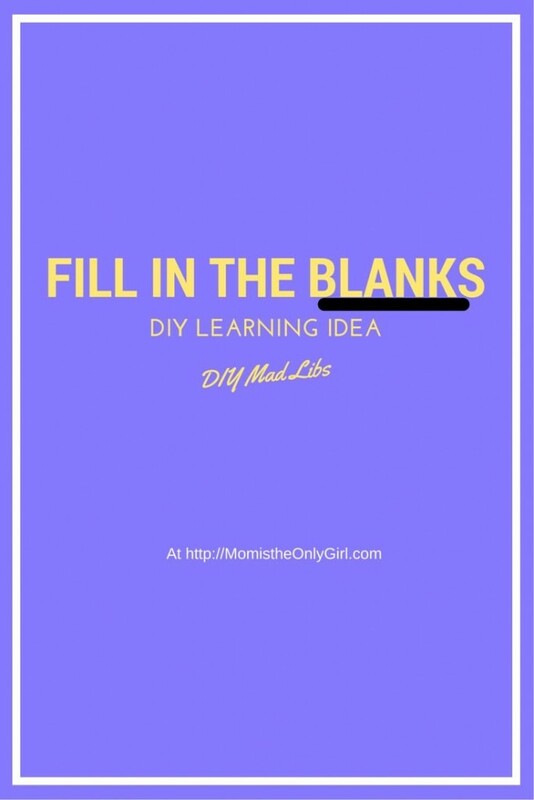 This activity can also reinforce parts of speech, like the actual Mad Libs with labels under the blank line, or just be focused on getting your child to write! I made up this simple Fill in the Blanks sheet to give Cutie Pie a quick activity that he could do all on his own (he was 7 at the time) while I finished up a project I was working on. This was so simple! 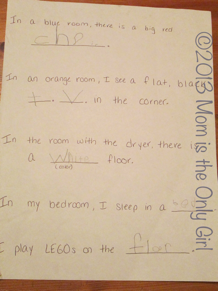 You can come up with a few sentences really quickly and have an activity that will keep your kids occupied! This is what mine looked like. You can see Cutie Pie’s answers that he filled in. Now that he’s in second grade I’ve moved from leading sentences (where it’s almost a little riddle he has to fill in the blank for – see above) to more story-like sentences, labeling the part of speech that is missing. This gives me a chance to be creative, too! You can vary this writing activity by simply leaving spaces in sentences for the kids to fill in, not indicating whether the word anticipated is a verb, adverb, etc. for those who don’t have this knowledge yet. It will lessen the questions from them. My boys seem to like this DIY Mad Lib change of pace during ‘boring’ times and I like that I can keep them constructively busy with sneaky learning!